Mikki Ball Pin Slicker for Sensitive Skin has been developed with specially shaped plastic tipped slicker pins, to help protect your pet's sensitive skin. 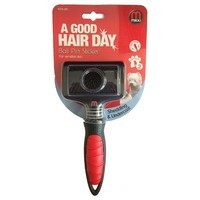 Mounted on an air cushion to enhance grooming action and reduce any excessive brushing force. the pins are designed to be used with a soft stroking action. The stainless steel pins will ease tangles and mats, and removed loose/dead hair from the undercoat, leaving the main coat clean and healthy. Had a slicker brush which my dog despised and she would run the second she saw it come out, it was impossible to brush her. When i ordered this i thought i was getting something slightly different and thought every tip was going to be covered with a ball. When i opened it i was disappointed. But i decided to give it a go. Use was super comfortable, My dog didnt run, she sat, she actually let me brush her chest, her back, her tail (shes very sensitive around her chest and tail) she actually didnt move, and absolutely loved getting her neck and back brushed. So yeah, impressed with both quality, the comfort of use and the design. Overall way way better than expected, better yet, its first time ever my dog enjoyed getting brushed.